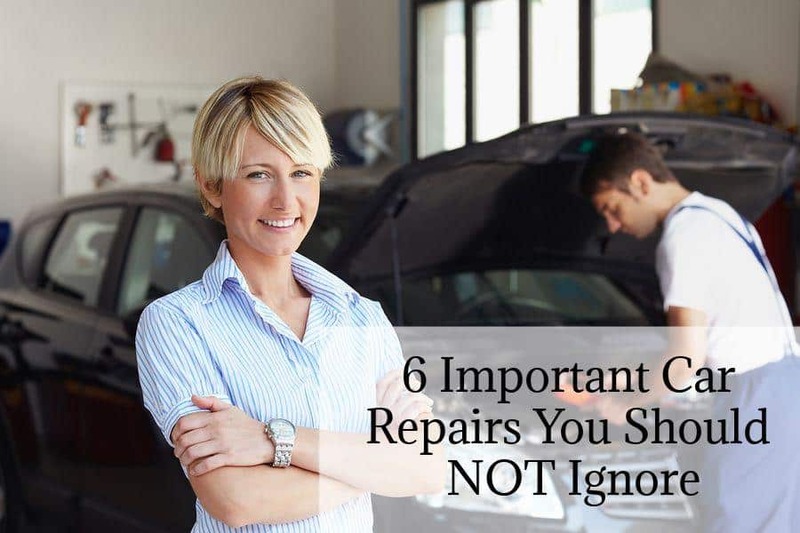 This post comes with an important caveat – ALL car repairs are important. Now, with that out of the way, here is our list of six car repairs you absolutely cannot afford to ignore. Each of the car repairs mentioned in this blog post has a direct impact on the safety, fuel efficiency, and performance of your car. Which is why we have listed these six car repairs. So, without any further delay, let’s dig in! Car fluid leaks are one car repair you should not ignore. Usually, when you take your car for routine maintenance, your mechanic will check the transmission fluid, as well as the coolant, brake fluid, and power steering fluid. Based on what they find, they may add or replace fluid. If, however, you notice a fluid leak before you’re scheduled for routine maintenance, have it checked up by your mechanic. Depending on the cause of the fluid leak, your mechanic will have the fluids flushed and replaced. The motor oil is literally the life-giving fluid for your car’s engine and all moving parts. If you overlook this one critical aspect, it could lead to some very serious damage to your car. Oil essentially serves to lubricate parts that would otherwise suffer immense damage due to heat and friction. With time, oil ages. It starts losing its efficiency. Which is why oil changes are an absolute necessity. Your owner’s manual will tell you when oil changes need to be carried out – it is also important to note, that as the car gets older, the frequency of oil changes will go up. If you are unsure about the frequency or have a question about oil changes, you can speak with your mechanic. The best way to prevent tire damage is by conducting routine inspections of the condition of the tires. If your tires are excessively worn out, it is best to go in for a new set of wheels. Regularly checking the tire pressure is highly recommended and critical to keeping your car tires in good condition. Low tire pressure will not only weaken the tires, but it could lead to a blowout. In addition, ensure your tires are rotated and balanced periodically as this can help in extending their life span. Over time and after regular use, the brake pads of your car will wear down due to friction. If this is the case with your brake pads, then it is best to have them replaced. If you continue to operate your car with damaged or worn brake pads, you run the risk of damaging your rotors and impacting your car’s brake system. Damage to the brake system can lead to higher repair costs. Ensure your brake pads are routinely inspected and replaced whenever necessary. As the car engine runs, it is only natural that the air filters will clog. The effects of a clogged air filter are linear in nature. What this means is that a clogged air filter will reduce the airflow. This reduction will, in turn, impact combustion. If the amount of air that is needed for effective combustion is reduced, the air-fuel ratio will be affected or altered. The effects of both these actions will wear down or damage the engine’s metal parts. We recommend that air filters should be replaced every 15,000 – 30,000 miles. It is important to carry out periodic tests on your car battery to ensure it holds a charge. Doing this kind of test is also necessary to check the tightness of the cables. Be sure you know your car’s battery date – the last thing you would want is to get stuck somewhere before you’ve had a chance to replace it! Ideally, most car batteries have a shelf life of 3 – 5 years. However, harsh driving conditions (driving in the hot desert in the summer time for example) or severe driving habits can lower battery life. A healthy battery will help improve your car’s efficiency; if the engine receives enough power, your fuel efficiency goes up and the engine will release few chemicals. Worried about any of the mentioned car repairs? We can help. Give Accurate Services a call today at 520-620-9129 or schedule an appointment online at your convenience!